I just realized that it’s been a few weeks since I posted some links! So here are a few that I have in my list… I’ve got more, but I don’t like posting more than 10-15 links at a time. Polaroid peel-apart instant film types: Examples galore! This entry was posted in Roundup and tagged action, advice, camera, Composition, diy, Equipment, Film, filter, funny, guide, howto, humor, india, indoor, inspiration, interview, lens, Lighting, link roundup, macro, map, mistakes, News, photo, photographer, photography, photojournalism, polaroid, portrait, reference, resource, Roundup, tips, Travel, tutorial on June 14, 2010 by Brian Auer. I think it’s safe to say that many of us have seen the “What the Duck” comic strips (and if you haven’t, I suggest you go educate yourself right now). 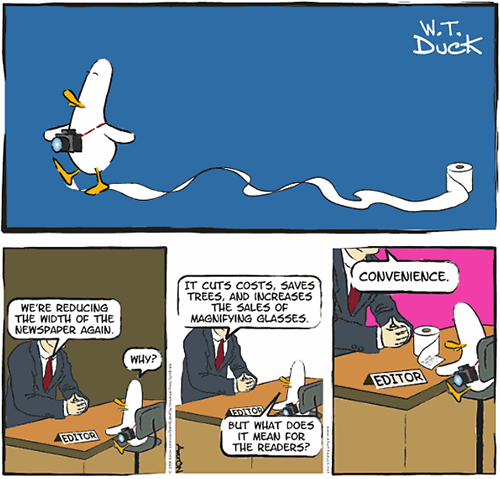 The basic theme of the comic strip is about a duck photographer and his journeys in the business. But you don’t have to be a professional photographer to “get it”, since many of the strips are humorous to a wide spectrum of photographers. In addition to the comic strip, Aaron Johnson (the author and artist), has been putting out a few books. “What the Duck: A W.T. Duck Collection ” is the second book released, and it contains 128 pages of comic strips. What the Duck: A W.T. Duck Collection (ISBN 978-0740780967) can be purchased directly from Andrews McMeel Publishing or through Amazon.com. DISCLAIMER: This is NOT a paid review, nor has it been reviewed or edited by the book’s author or publisher. The book was sent to me by the author free of charge. I am in no way affiliated with the book, the author, or the publisher of the book. Well… it’s a comic strip book. Don’t expect to find any breathtaking photos or golden nuggets of technical advice. Of course, the theme of the comics are very much photography related and full of wisdom. As I said, the book is 128 pages. It’s soft-bound (which is suitable for a comic strip book) and the size is approximately 8.8 x 8.4 inches. A typical page has three 3-frame strips from top to bottom, but occasionally you’ll find a page layout like the image shown at the top of this post. Everything is also printed in color, and the humor contained within is quick and to the point. In case you’re not already familiar with the comic strip, I’ll do my best to give an explanation. The main character (the one wearing white) is a photographer who happens to be a duck. In fact, all the photographers are ducks (of various other colors). Clients, editors, models, and pretty much everyone else is not a duck. The comic has a somewhat dark sense of humor — the duck is always getting the short end of the stick, he knows it, and he just keeps dealing with it. The most amusing thing about the comic strip is that the scenarios presented are true to life in one way or another, and as you become more involved with photography you tend to find the comic more amusing. Some (maybe all?) of the strips in the book have been published on the website, but I want to say that some of them are unseen prior to the book. I’ve been following the comic strip on a daily basis basically since it started and I came across quite a few that didn’t ring any bells. I could be totally wrong on this point though, since my memory is less than stellar. Aaron Johnson is the creator and artist of the “What the Duck” comic strip, a fellow photographer, Photoshopper, and in a band. Other than that, I don’t know a whole lot about him. Obviously he’s very creative, has a great sense of humor, and the ability to create a cult following via comics. If anybody knows more than this about Aaron, please start a Wikipedia page about him. If you’re a fan of the comic strip — definitely get the book. It’s going for about $10 on Amazon, which is ridiculously affordable. As is the case with photos looking 10-20x better on paper rather than a computer screen, the same is true with comic strips. In print, the strips are bigger (unless you sport the 800×600 res), cleaner, and less pixelated than what you’ll find on the website or rss feed. If you haven’t been following the comic: go check out the website, laugh, become obsessed, THEN buy the book. Either way, the book is scheduled to release on September 15, but Amazon has started shipping orders early for some folks — so go ahead and place your order now ! Oh yeah! You guys didn’t think I’d leave you hanging, did you? Aaron told me he’s sending a few extra copies my way so I can hand them out to a few lucky winners. Not sure how many or if they’re signed copies, but I’ll let you know as soon as I know. So how do you get a free copy? Let’s make this a little bit of a photo contest. Post a link or an image in the comments below to a photo (of yours) that is somehow related to ducks or the What the Duck comic. So it could be a photo of a real duck, a fake duck, a drawing of the comic character on the beach, a light painting of the letters “WTD”, or whatever else you can think of (and it’s possible that photos of other birds will be accepted for consideration, but I’d prefer ducks). If you don’t have any photos like this in your archives, get out there and shot something! Just keep it to a single photo or link to a photo. I’ll finalize the deadline when I get the books, but I’d say it will be in about 1-2 weeks from now. After the deadline, I’ll pick out my faves and ship out the books to the winners. [UPDATE] I just got the books in the mail today, and we’ve got 2 copies to hand out! I’ll pick out two of my favorite duck photos on Monday, September 21 — so get your duck photo in the comments before the end of the weekend! 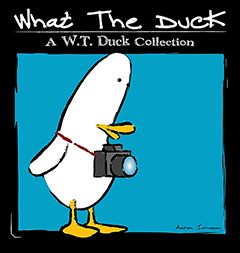 This entry was posted in Features, Reviews and tagged book, book review, comic, comic book, comic strip, duck, funny, humor, photography, review, what the duck on September 11, 2009 by Brian Auer.